The Wall Control Pegboard 32in Tall x 16in Wide Galvanized Metal Pegboard Tool Board Panel is Durable, Versatile, and Attractive. This Wall Control Pegboard Panel is constructed from 20 Gauge Steel and is over 10 times stronger than conventional pegboard. The Metal Pegboard Tool Board Panel will accept conventional 1/4in standard peg-board hooks as well as Wall Control's patented and secure slotted pegboard hooks and accessories. 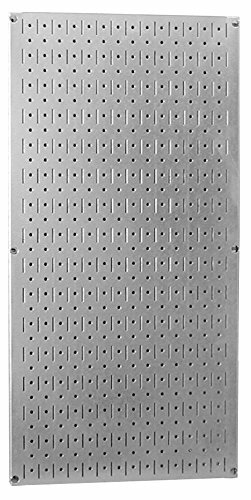 The Pegboard Panel Includes (1) 32in x 16in Galvanized Metal Pegboard Tool Board Panel with Mounting Hardware and Instructions. Made in USA.